Mobile devices (notebooks, smartphones and tablets) represent the new norm for staff and managers in all kinds of enterprises. It’s become increasingly common to walk into a meeting and find at least one participant with a notebook, two mobile phones (for work and home) and a tablet. Mobile devices are small and valuable, making them favorite targets of thieves. But, in fact, the content on the devices is likely more valuable than the device itself. So security awareness needs to extend to the content itself. 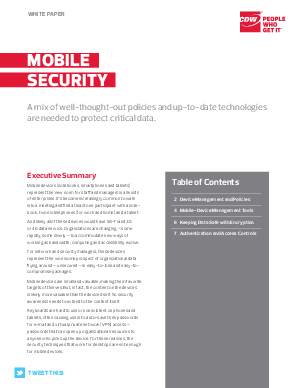 To learn more about mobile security download this whitepaper.